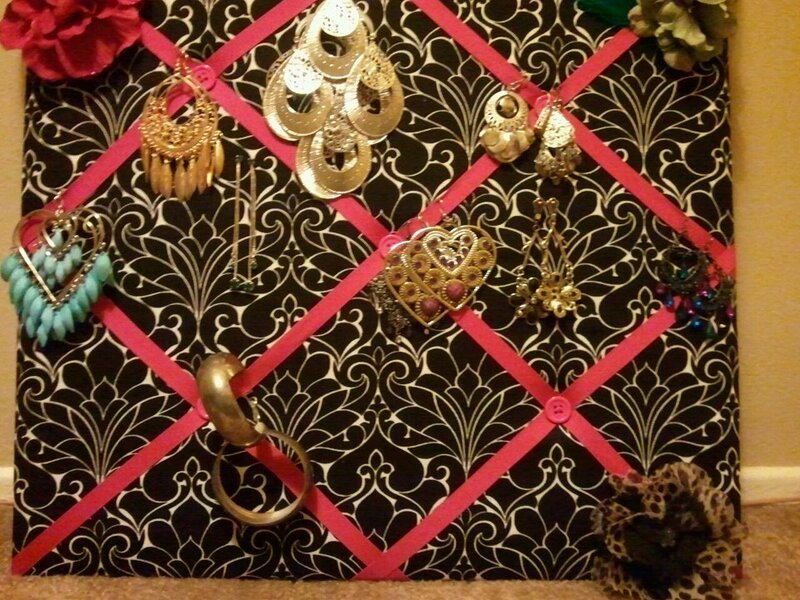 Mama On A Budget Tip: Re-Purposing a Cute Note Board! I have a large collection of earrings and hair flowers that have found homes all over my apartment. I’ve been in my “Organization Madness” kick and have been thinking hard how to get these in one place that I can easily reach and just as easy to put away. Being on that “shoe string” budget I would have LOVED to buy a big jewelry cabinet but that is not the case. On my recent trip of walking around the aisles of “Ross” I came across this beautiful Hot Pink and black print design note board. I have never thought to use one for notes but really enjoyed the design. It cost $5 and decided to use it in my inspiration room design as a way to tie in the colors at some point. I sat it in my living room and stared at it for the last couple of days. Then it HIT me! I can re-purpose it and use it to organize my earrings and hair flowers. I will be visiting another “Ross” store soon and see if I can find another one to accommodate the rest of my collection. It is GORGEOUS and am very happy to think of this idea! What do you think? Previous Post MamaOnABudget: Let’s do some MATH – SAVE and Lower Our Expenses! Next Post My FIRST Vacation After 2 Years At My Job!! !